If you’re looking at our website then it’s very likely that you’re considering investing in a new website design. As a leading UK website company we work with leading national and international businesses to produce innovative and powerful website solutions and help you strengthen your organisation. There are numerous reasons why it’s prudent to regularly invest in your website. A new web design has the potential to rapidly increase your traffic, conversion rate and ultimately your turnover. It will impress potential customers and strengthen the loyalties of existing clients. We understand that it isn’t always possible to sign off on a new website design immediately. If you’re committed to investing in a new website – but need to work through the relevant procedures before commissioning a UK website company – then you might want to consider the following 4 ways to improve your website design right now. 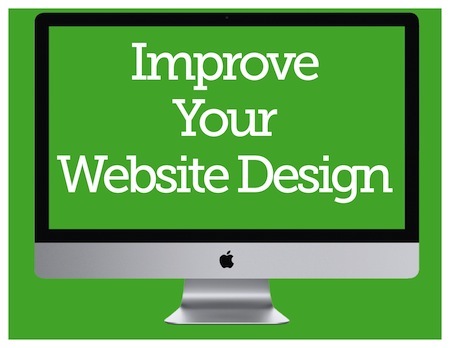 Taking steps to improve your current website will help you in a variety of ways. It will ensure that you are maximising the potential of your current site. It will help you to safeguard against some of the website maintenance faux pas that blight website owners. It will also help you to appreciate and articulate the limitations of your current site to ensure that decision-makers understand the urgency of investing in a new website. If you haven’t updated your content recently then it’s wise to consider rewriting your copy. This will help you to ensure that everything is up-to-date, accurate and helpful for your readers. You might find it helpful to use your latest marketing materials as a source of inspiration. If in doubt, remember that less is more, and don’t forget to answer the questions that your potential customers will be asking. Outdated imagery can very quickly undermine the confidence of site visitors. By using professional, strong images you will be able to improve the quality of your web design and communicate your values more effectively. There are various ways to source high-quality images, including stock photography, commissioning a professional photographer or taking advantage of skills that you have in-house. Photography can help to create trust and help site visitors to understand more clearly what you’re about as a business. Once you’re happy with your website content, an important step is to ensure that it is carefully optimised for search engines. By ensuring that agreed keywords are included you will increase the likelihood of showing up in key search results. Whilst off-site SEO can be particularly diverse, on-site optimisation can be achieved in a matter of hours. Perhaps the biggest weakness of outdated websites is that they can be prone to delivering a very weak user experience. Considering user experience – and identifying the journey that you want site visitors to take through your website design – you’ll be able to establish possible improvements for your current site and work out what you’re looking for when you go through the redesign process.